As I mentioned in my earlier post, Overlooked Women in Tech Innovation History, in the late 1890’s 58 percent of science, technology, engineering and math (STEM) students were female. So what happened over the years to the number of women taking STEM classes, and being in STEM careers? I did some quick checks to see if I could find research studies looking into this. What I found at first blush was intriguing. The research also states that in the 1990s, many women seemed to lose confidence that they could succeed in a field where all the early dot-commers were male graduates of prestigious universities, and where generally all those who founded the companies were men. The premise is that the lack of women tech company founders made it seem like women were not cut out to lead tech companies. 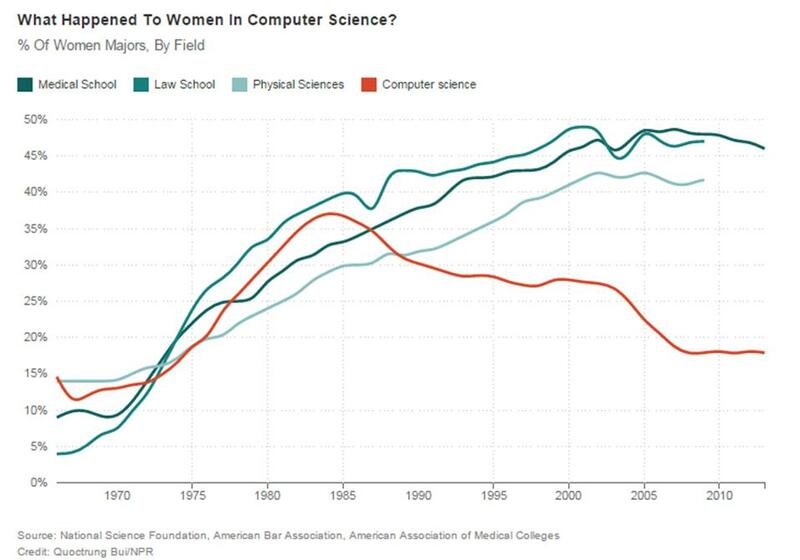 Between 2000 and 2008 there was a 79% decline in women majoring in Computer Science. 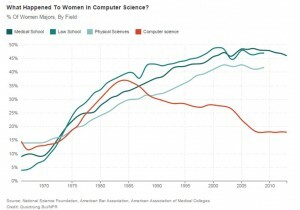 Correlating to this was that the numbers of women studying computer science continued to shrink by almost one-half from a high in the mid-1980s to just 18 percent in 2015. Another theory is that women encountered subtle discrimination that caused them to avoid going into the STEM fields. An example of this is the observation in one study that teachers at schools reward female students for the appearance of their work not its content. 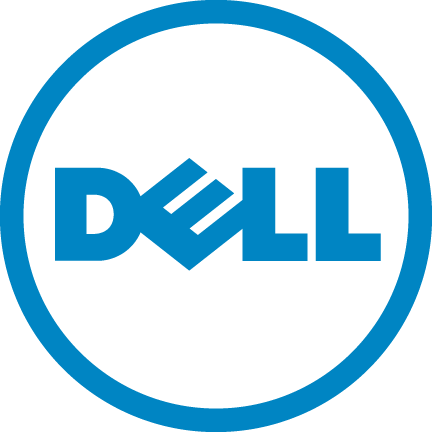 Computerworld reported that 52% of women dropped out of technology fields in mid-career in what was described as a “fight or flight” response to permeating “machismo” in the work environment, and due to 63 percent of women in STEM experiencing sexual harassment. These hypotheses seem to be supported for computer programming (now more commonly referenced as coding) by a late 2014 National Science Foundation research results graph, shown in Figure 2. This same report also points to the rise of PCs correlating to the decline of women generally in STEM, and particularly in computer science. In 2015 ISC2 took a poll of nearly 14,000 information security professionals in developed countries. They found that only 10 percent were women. That is down from 11 percent when they did the poll two years earlier. These few findings are intriguing and motivate me to do more research into this topic in the coming months. I speak at a lot of events. I’ve been invited to speak as a keynote, and for additional sessions, all over the world in not only the U.S., but also in Bogota, Colombia, Singapore, Melbourne, Australia, Ireland, and most recently Copenhagen at the beginning of this month, just to name a few. In January of this year I received an invitation to deliver a keynote about my Internet of Things (IoT) security and privacy research at an IT conference in the summer. I accepted the invitation, but I did not hear from the conference coordinator again for several months, so I got back in touch with her. She told me, “Oh yes, that. We decided that a man would be a bigger draw than a woman. Men are just considered to be more knowledgeable, and to be the experts, than women for that topic. Nothing personal. We may be able to use you for another conference, though, in some way.” Hmm. Well, no you won’t. I’m not going to attend any of your upcoming conferences. Nothing personal. Data Security Experts Reveal the Biggest Mistakes Companies Make with Data & Information Security: 1 of the 30 experts they asked to contribute to this article is female. So, the tally results in: 7 of 128, or 5 percent, of the speakers/experts were women. We need more conferences to invite women to be speakers. There are many women in tech who are outstanding in their professions. They have much valuable information to share. We need more women to submit proposals to be speakers. I know many don’t because they’ve been rejected so many times that they feel it will just be a waste of time to keep writing proposals that will get rejected any way. I personally no longer submit proposals for certain conferences specifically because of that. But, I really do need to submit any way. And so do more women. We need to start highlighting the percentages of speakers at all STEM conferences to highlight imbalances in gender representation where they exist. Sooner (hopefully) or later conferences will change after they’ve consistently been reported to be so far out of gender balance. We need more online forums to recognize more of the many women who are exceptional in their professions and ask them for their opinions to add to the predominantly male views. We need BOTH men and women to purposefully include women in events and forums whenever an opportunity arises. Women, we need more of you to write. Writing is a powerful way to demonstrate your capabilities, strengths, and expertise. Writing also shows that women are just as capable and possess as much expertise as their male counterparts who are doing 90% of the writing. Dealing with various types of challenges throughout your career: things I’ve learned. Know the many types of opportunities that exist, and are emerging, within the IT, information security and privacy career space…it’s not just about laws! Answer, “Is it too late for me?” Can you make the move into new areas of IT, information security and privacy after being in the workforce for 20+ years? Know how to get it right from the start – what courses should you be taking at the university level to prepare yourself for an IT, information security and/or privacy career? Why mentors can be great or not great: knowing when to use mentors, and finding the mentor that is right for you. There is a lot of discussion online, at meetings and conferences about how to get more women involved in STEM careers in general, and in information security and tech in particular. Looking at the history of women in STEM, and also the current inclusion or exclusion of women in conferences and online forums, helps to highlight actions that can be taken now for women currently in colleges and workplaces. We also need to provide the same opportunities to girls from the youngest ages, both at home and in schools and clubs. Making just one change will not make an impact. But making many changes throughout the entire stages of life and professional careers will start making noticeable changes. It is time to do so. Women in STEM: Take the lead to secure a path for the future. 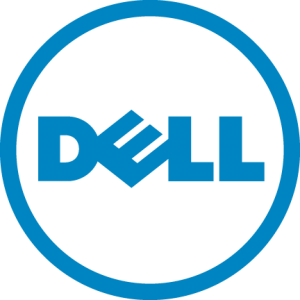 This entry was posted on Friday, November 20th, 2015 at 6:00 pm and is filed under Women in Tech. You can follow any responses to this entry through the RSS 2.0 feed. You can leave a response, or trackback from your own site.